In the UK we are blessed that there is a network of Mountain Rescue Teams (MRT) situated in and around the upland areas the country. All teams are charities, staffed by volunteers, funded by donations and receive no government grants or income. Their non-professional status does not mean that standards are not professional; far from it. Team members train on a regular basis to maintain skills and learn new ones, and aside from their work in the MRT, they have day jobs and families. 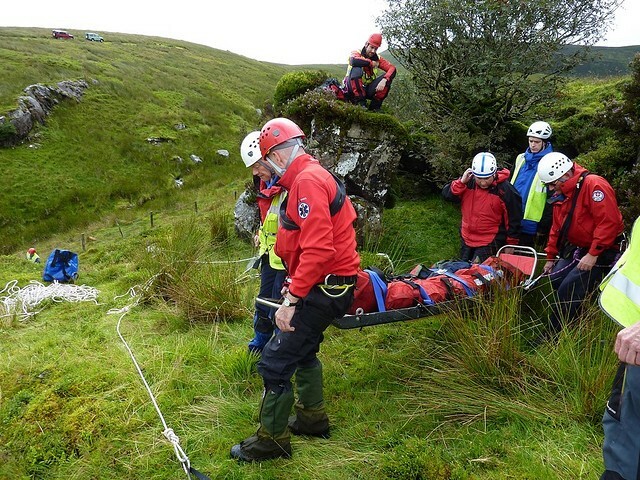 They turn out on a call-out at any time of the day or night, in any weather and to the hill-goer, mountain rescue teams are often the only emergency service that can reach them in an emergency situation. When an MRT is called out, each of the team members puts their life at risk in an effort to save a total stranger. Calling out an MRT should be a last resort, not something that is done at the first sign of trouble or getting lost. Hill walkers should be well equipped; with sufficient kit to keep warm and dry in a range of weathers, sufficient food to maintain energy levels, sufficient navigational ability not to get lost, and sufficient skill to know the appropriate time to call for mountain rescue, before a serious situation goes badly wrong. As discussed in the previous section (how to call for help), if you are in an emergency situation and in need of help, your first point of contact is the police. They will contact the appropriate MRT for your area and co-ordinate the rescue with the team. Once you've called for help you're in for a wait. As a minimum, and of course depending on your distance from the nearest road, you'll be in for a wait of at least 2 hours. During that time, you'll need to stay in the same location and keep warm. Put on extra layers and get into a survival bag and into a storm shelter if you have one, and wait.